Let the Kooky play begin! Let the Kooky play continue! UPDATE: This post was originally published in January 2014. Since that time, I’ve discovered new sites for cutters and added those below. While posting images of my holiday baking for 2013, I started thinking about cookie cutters. It probably comes as no surprise that I have a pretty big collection of cookie cutters. The makers include Wilton, Fred, Copper Gifts, R & M, Nordic Ware, and Fox Run. Gingerbread men with “bites” in the head, or intentionally missing limbs are cute and funny surprise to find in a cookie gift box. Fred has taken gingerbread men to a whole ‘nother level–they have Ninjabread, Undead (zombie) men, and ABC (Already Been Chewed) men. Every year, they come out with new ideas; their catalog is really funny to peruse. They do not just make humorous kitchen gear. Are you a collector, an avid baker, or both? Do you know a cutter collector or baker? Cooking supply stores: In Charleston, we have Coastal Cupboard and Southern Season (Mt. Pleasant), Charleston Cooks! (Downtown), and the Kitchen Collection Outlet (Tanger North Charleston). Our restaurant supply stores are Berlins and FRS. Stores You Already Go To For Groceries, School Supplies, and Household Basics: Walmart and arts and crafts stores like Michaels, JoAnn, AC Moore, and Hobby Lobby, are good places to pick up Wilton cutters and big jar sets of plastic cutters. World Market, Dollar General, Publix, and Target also carry some plastic sets, especially in November and December. Target carries some Fred products too, especially in July and August for the college crowd. All of the above also allow you to do some shopping online, or if you must find a store they say so. Sandwich cutters can also double as cookie cutters; they typically are hanging in the aisles of grocery stores near the nut butters, jellies, and sliced breads. Discount stores means serendipitous shopping encounters: You never know what you will find at Ross, Marshalls, Marshalls Home Goods, TJMaxx, Tuesday Morning, and Big Lots. They have websites, but the websites don’t feature e-commerce functionality. They want to motivate shoppers to visit a local store. These sites typically don’t compete with stores by offering online shopping. Online Steel (Non-Enameled) Cookie Cutter Heaven: CheapCookieCutters.com and The Cookie Cutter Company. Online Higher-end Kitchen Tools Stores: Fancy Flours, Williams-Sonoma, Pfaltzgraff, Crate and Barrel, Urban Outfitters, and All Modern. If all else fails: Amazon or Etsy. Etsy has a lot of 3D cutters of pop culture characters from the 1980s­–present. So if you are buying for a gamer, or someone born after 1960, check there. Also, Thinkgeek carries a lot of sci-fi, fantasy, and gamer-themed cutters. ‘Want a cutter that doesn’t exist? Make it yourself: There’s a Cookie Cutter Making Kit at Amazon. Do you have a 3D printer? You can make your own cutters that way. Check out Etsy to see what other people have done. If I make new discoveries in this area I will make followup posts to this one. In the meantime, Happy Baking and Happy Shopping! I also made some sugar cookies this year, including a leg lamp from “A Christmas Story.” This cutter is available here. It has the cookie details on the inside of cutter. This only works if your dough is rolled out to about 1/2-inch thick (the height of the cutter) though. Mine was not, so I went back in and added fishnet details with a fork. This is the Apple Pear Pie I baked this year for the holidays. I guess I am spoiling the glamorous mystery of this food writer’s life, but, surprise! I cook at home quite a bit, both weekdays and weekends. On weekends and days off, we start the day with sauteéd bacon or sausage, over-medium eggs, pancakes or biscuits. I admit I use Pioneer Pancake Mix and frozen biscuits. For more unique flavors in the pancakes I’ve added sliced bananas and cardamom spice, or unsweet applesauce. Occasionally I will dally into omelettes or poached eggs. Burritos: Seasoned ground turkey, diced tomatoes with chiles, and shredded cheese. The tortillas are warmed in foil in the oven. Sides are refritos (with a little greek yogurt and cumin added for taste), or rice. A great ready-made sauce for turkey is Frontera by Rick Bayless; it’s a a quick alternative to using dry or fresh herbs. Better Butter Chicken from Sarah Fragoso’s Everyday Paleo blogs and books, over a bed of cooked spinach. A ready-made sauce for this dish is here. Chicken Florentine. I make a lighter version using chicken broth based sauce instead of the usual cream sauce. Pork Chops sauteed with shallots and granny smith apple slices is another quick-dinner favorite. Now that it’s Fall, more oven-intensive meals are more inviting option. For instance, bringing homemade chili back into the lineup. I use 3 ground meats (pork, beef, chicken or turkey), kidney beans, diced tomatoes, diced yellow onion, chili powder and other herbs, diced white onions, and unsweetened cocoa. It’s all simmered for most of an hour in a big Dutch oven pot. More seasoning is added to taste. I serve baked cornbread on the side. 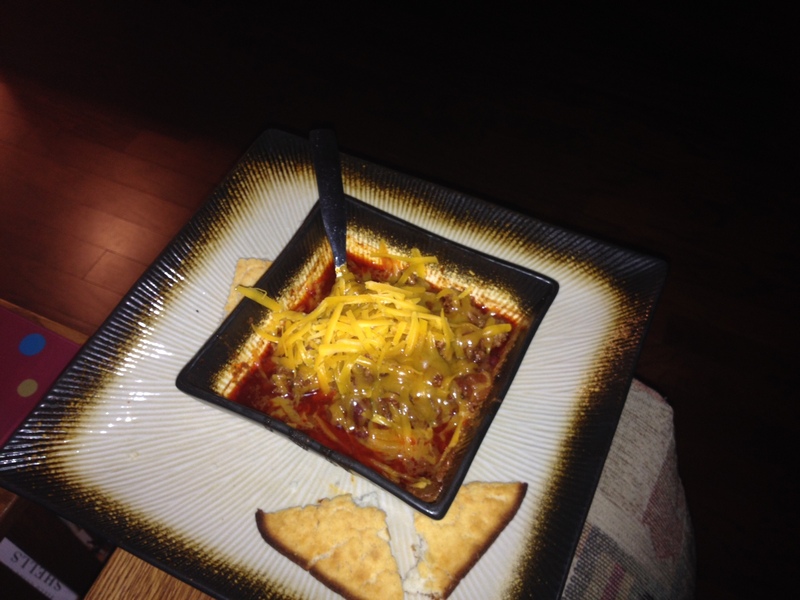 One thing that’s great about chili is there are plenty of leftovers if you are a small family. It’s waiting to be warmed up for lunch or dinner for the next few days. I may also bake a whole chicken with lemon and garlic cloves in it. Rice will probably be on the side. At least once a month, I mix and bake up a double batch of egg cupcakes, based on another recipe from Sarah Fragoso. Each time I make them, we’re covered for 2-3 weeks of a great go-to weekday breakfast in the microwave. Otherwise I enjoy greek yogurt with muesli on top, or cottage cheese. If you are disappointed by cable networks’ personality-driven recipe books being tasty but not very healthy, I recommend Sarah Fragoso’s Everyday Paleo series, Julie S. Mayfield’s Paleo Comfort Foods, and Tosca Reno’s Clean Eating series. I am also very excited about books from PBS’ chef personalities, ‘especially the ethnic cuisines–Alamelu’s Indian, Ming’s Pan-Asian, Lidia’s Italian, and Newscancook’s Scandinavian foods. And that’s just four of many more shows that are on PBS. And if local caterer Brazilianuts ever writes a recipe book, I would pick that up as well; in covering regional charity dinners in Charleston on two separate occasions this year, I’ve learned there is so much more to Brazilian food than steak, and there’s so much more to learn about it. And I really love learning about foreign foods, especially when it manages to be tasty and healthy at the same time. UPDATE: This post was originally created on 10/11/13. When I wrote it, I could only remember the name of the book and that the author was a really tall auburn-haired chef named Julie. Fast forward a month later, I discovered Julie Mayfield’s books had a blog so I updated that part of this post on 11/5/13. A key lime, honeydew frozen pie, with a Yoda theme. I was told the ears should be shorter and have more of a paisley shape/waviness to them. I used a diagonally split bread pan for this go round. Next time, I could use a half-size bread pan. –simmer the key lime and honeydew juice down to a thicker consistency, for lots of flavor, but far, far less water. I am storing the pie in the freezer because anything less is far too warm here in the steamy South, even a 38 degree fridge. –I would really like to find Oreo crumbles for the crust. Chocolate grahams are okay, but Oreos would be preferable. I was happy with the color and the flavor of honeydew with key lime. Usually I post the recipe but since this one is still under construction I will hold off. I used a 6″ springform pan for the middle circle, and as I said before, a diagonally split bread pan for the ears. I baked them for 8 minutes at 350°F. They seemed too soft and not brown enough, so I baked them an extra 4 minutes. 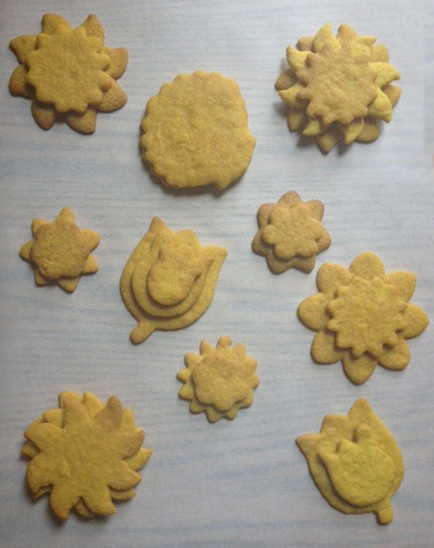 If I were to bake them all over again, though I think 10 might be interesting–to keep the color at its brightest. After allowing them to cool, I sampled the results and so did my husband. The taste starts sweet but ended bitter. I thought I’d made a Kooky, but it’s really more of an eastern-influenced digestive biscuit. Uh what-now? you may ask. In British English, a cookie is a biscuit. And a digestive biscuit is a pragmatic after dinner cookie. It is made with bran, wheat, or other grains. it’s the practical matter of aiding digestion and I would think, preventing indigestion. Turmeric and ginger are herbs that aid flavor or color, but both are beneficial for your stomach and digestive system. Turmeric can color your yellow rice for paella–it is much cheaper than saffron, and it doesn’t take much to deliver the hue. It can stain plastic and silicone kitchen tools, not to mention your clothes. To keep with the warm color trend, I chose marmalade for the filling. All the Kookys were placed on parchment paper on a cookie sheet. I just put a 1/4 dollop in the center of the smaller Kooky, then flipped over on top of the larger Kooky of the same shape. I didn’t spread the marmalade to the edge–once the smaller Kooky is placed on the larger Kooky, the compression causes it to spread more. If I had spread the marmalade to the edge, then placed it on the larger Kooky, the marmalade would seep beyond the dimensions of the smaller Kooky; it would look oozy and sloppy. Once I had put marmalade on all the Kookys I could, I put them in the fridge for at least 3 hours so the marmalade would re-solidify and be less runny. I sampled one and the bitterness seems to be less present. 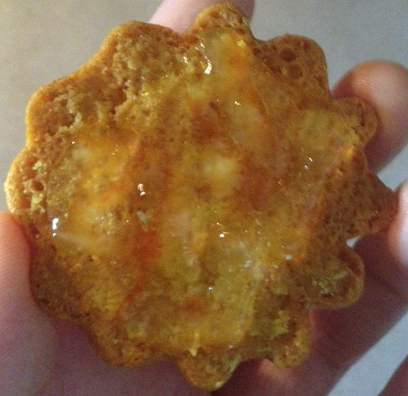 So all the Kookys that weren’t part of a pair were topped with marmalade as well.